Deep Silver says it has no intention of compromising the Metro franchise, it just wants to make future games in the series even bigger and better. Compared to Metro 2033, Metro: Last Light is a hand-holding tiptoe through the tulips on a warm spring afternoon, but it's still pretty far from mainstream run-and-gun giggles. The world of Metro remains grim, dirty and vicious, without a hint of winking irony in sight, and the only way to escape the claustrophobic confines of the Moscow Metro is to go to the surface, which will kill you just for trying to breathe. Good times, right? It actually is, in the eyes of an awful lot of fans, and so when Deep Silver Head Dude Dr. Klemens Kundratitz said last week that the publisher wants to make it "more accessible for a broader gamer audience," there was not exactly widespread rejoicing. Recognizing this fact, Deep Silver Global Brand Manager Huw Beynon has now put out a statement of his own, reassuring gamers that the publisher has no intention of "dumbing down the game in a bid to woo a wider, more 'casual' audience." "We understand the concern, and we would like to reassure the Metro fanbase that Deep Silver has absolutely no intention of compromising Metro's unique DNA. We completely understand that it is the passion and evangelism of our fans that allowed Metro to grow from a cult hit to genuine, bonafide hit," Beynon wrote. "Whatever direction a new Metro game takes (and we are still assembling the drawing boards), it will build on the bleak, post apocalyptic pillars of atmosphere, immersion, challenge and depth that sets this franchise apart from the crowd." When Kundratitz talked about making the game more accessible, Beynon explained, he was referring to releasing it on a wider range of platforms, making a greater "strategic investment" in the Metro brand and ensuring that future games measure up to their predecessors. "This is just the first stage of a broader initiative to bring Metro to a wider audience, without compromising the product's strengths," he wrote. 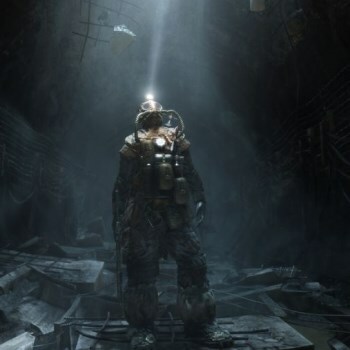 "Metro is a pulsating, radioactive gem in Deep Silver's crown of rotting zombie flesh, and we believe we can build on the success of Metro: Last Light by doubling down on our unique brand of bleak, Russian, post apocalyptic horror." Of course, he would say that - he's the brand manager, after all, and this is his fire to put out - but I suspect there's a legitimate disconnect between what Dr. Kundratitz said and what he actually meant. Whether or not Deep Silver will actually follow through on Beynon's promise is a matter for some future debate, but this wouldn't be the first time that a CEO of a major publisher drove gamers nuts with what he intended to be good news, and I bet it won't be the last, either.